> flawless witnessing of The Indweller (Antharyamin). > > ato'nyad artam. tato hoddalaka arunir upararama. > > is not capable of being seen. > > see it, but it sees you. It sees everyone, but no one can see it. > > Asrutah srota: It can hear everything, but no one can hear it. > > Amato manta: You cannot think it, but it can think you. > > Avijnato vijnata: You cannot understand it, but it can understand you. > > other than that. > > Nanyo'to'sti manta: There is no thinker but that. > > anything, it is that which does. > Indweller (Antharayamin) is Shakti/Holy Spirit/Ruh/Eykaa Mayee. > Ruler; this is the Reality. This is immortal, O' Uddalaka. > And that the Spirit of God dwelleth in you. > Just as God fills the whole world, so the soul fills the body. > Just as God is pure, so the soul is pure. > So also the soul dwells in the innermost part of the body. > attributes that are found in every part of God. > And all of you are children of the most High. "Unless you make yourself equal to God, you cannot understand God: for the like is not intelligible except to the like. Make yourself grow to a greatness beyond measure, by a bound free yourself from the body; raise yourself beyond all time, become Eternity; then you will understand God. Believe that nothing is impossible for you, think yourself immortal and capable of understanding all, all arts, all sciences, the nature of every living being. Mount higher than the highest height; descend lower than the lowest depth. Draw into yourself all sensations created, fire and water, dry and moist, imagining you are everywhere, on earth, in the sea, in the sky, that you are not yet born, in the maternal womb, adolescent, old, dead, beyond death. If you embrace in your thoughts all things at once, times, places, substances, qualities, quantities, you may understand God. "Yoga is a comprehensive set of spiritual practices designed to enable us to realize the greater universe of consciousness that is our true nature. The term Yoga means to unite, coordinate, harmonize, work, or transform. It refers to the linking all aspects of our being, from the physical body to our highest intelligence, with the true or universal Self that dwells within the heart. This process occurs in different forms and stages relative to the condition of the individual and variations of time, place and culture. Vedic knowledge is that knowledge of the Divine or higher Self that the practice of Yoga is seeking to realize. Veda is spiritual wisdom and Yoga is its application. 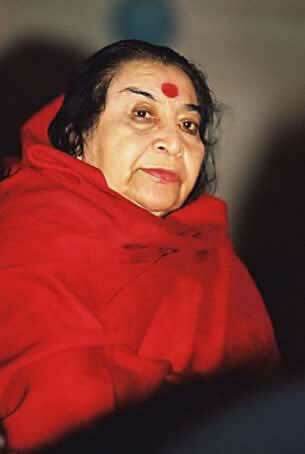 "I am the Primordial Mother and I have to do the job of awakening the primordial nature, the Dharma within you human beings, and that's what I have to do and nothing else. But for that I don't do anything. I am Nishkriya. I don't do anything. Really, I don't do. It's done by Nature, done by Shri Ganesha, Vishnu, Mahesha, everybody. They are all doing it.